All of our soaps are made with Farm Fresh Goat's Milk. I have enjoyed the benefits of Goat's Milk soap for many years now and welcome you to try my many hand made products. I hope they benefit your skin as they have mine. We use soap in our lives everyday, and you have probably noticed how drying commercially made soap is to your skin. There is a reason for that, the product you buy, has been altered from the natural soap made. In commercial soap production the Glycerin component of their soap is taken out and only a little is put back in before selling the glycerin separately, leaving your bar of soap very harsh and drying to your skin. In the natural process of making soap - roughly one in every four molecules is Glycerin. Glycerin is a humectant, which promotes the retention of water and smooths, softens and protects the skin. Handmade soap is as natural as you can get, after mixing quality oils, with the Goat's Milk Lye solution, the soap mixture is poured into the required molds, left to set for 48 hours then unmolded. Curing takes around 2 months, however I like to dry my soap for a minimum of 6 months, ensuring the soap is as long lasting as possible. All of our soaps are made by Hand, this process retains the Glycerin, providing a lovely rich and moisturising bar of soap mild enough for sensitive skin. Goat Milk is highly recommended by health professionals for drinking, as a replacement for cows milk as the fat molecules in goat milk is more easily digested by our body. Goat Milk added to soap is believed to be very beneficial for our skin - so we add lots of it.... All of the soap produced is personally made by me, in small batches of 3 kilograms or less, ensuring only quality soap is produced. If you would prefer to pay by direct deposit or mail order, you can email me your order, and once received I will post out your parcel. As all Hand made soaps are glycerin rich, it is important to air dry your soap between each use, this will ensure a longer lasting bar. If one person is using the soap you should expect the soap to last 4 weeks or more, if more than two people, it would be best to alternate a few bars at any one time. NEW Face Cleanser & Moisturiser fragrance free & sulphate free. Mild everyday cleanser in Gel or Cream - 200 ml size. Moisturiser for everyday or try our specialised Night Replenisher - 100 ml size. In 1998, I developed eczema on my hands, they were constantly irritated, extremely dry and cracks developed in all of my finger joints. After weeks of desperation, I went to the doctors. I was prescribed numerous creams over the following five years, these were based on cortisone and only helped at the time of application. There was no long lasting benefits, it didn’t cure the eczema, just stopped the immediate irritation and let my hands repair, the cost of this prescription was around $20 per fortnight. After five long years, my eczema remained the same. Only healing when creams were applied. 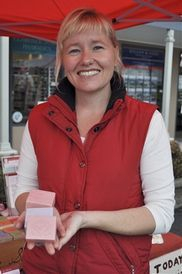 Happily we moved to the country, and my wonderful new neighbour Kim, bought me a bar of Handmade Goat’s Milk soap (only as a bit of a joke, because I had goats in the paddock). Instantly I could feel the difference to other soaps, no drying out of my skin and my eczema just disappeared. This natural bar of handmade soap took away all the itchiness and left my hands feeling the best they had in years. As I have a hobby farm with goat’s, it seemed only natural that I would make my own soap, and with wonderful encouragement from family and friends, I have decided to sell to the public. I am happy to say, that since 2003, I have not visited the doctor even once. I have had a few skin flair ups, due to food allergies etc, but every time I will simply wash my hands with my soap and every time the itchiness will be relieved. In 2005, we started making our own Handcream, it has worked wonders on my now, worn out farm hands. Enriched with Cocoa & Shea Butter this gentle quick drying cream, provides instant protection. I have found absolute relief from this cream when my hands break out with dry itchy patches. Choose from fragrance free or a variety of perfumed fragrances, available in small 100ml or large 200ml. Special orders welcome.